They do this on purpose you know. Big comic conventions running PR about their respective shows in the week the other big shows are happening. I’m not sure it’s effective, surely waiting till after the competing show is finished, the Monday when people are travelling and news is sparse would be a perfect time to announce something. As opposed to competing with a rival show’s ramping up publicity when more people are talking about it than at any other time in the year? New York Comic Con always does it in San Diego Comic-Con’s week. And SDCC does it right back. Which is why, this week of all weeks, we are talking about SAM. Storytelling Across Media, last held by Comic-Con International in 2016. And focusing on telling stories whatever the medium and looking at what medium may suit what story the best. 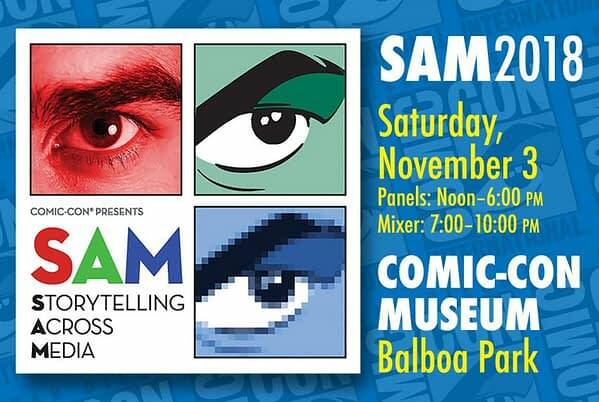 This time it will be in the new San Diego Comic-Con Museum in Balboa Park on Saturday. November 3rd, a mere month away. Two rooms, 141 seats in one, 70 in another. This is not Hall H. There is no showfloor. This is an intimate affair, with 6 hour-long panels in each room, open from noon to 6pm. With speakers including Jim Lee, Joe Michael Straczynski and Julie and Shawna Benson sharing their knowledge and expertise. Then followed by an evening social event. Hopefully, I’ll be able to get some Bleeding Coolers to go. As soon as they have recovered from NYCC that is. Will you be going?